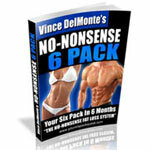 Today I have six more vegetarian foods NOT to eat, especially if you wish to lose weight. Whether you’re a vegetarian or vegan or whether you’re looking for steel-solid muscle mass or to lose stubborn fat, the nutrition info below will dramatically transform your healthy, energy, complexion and physique. I have attached (soon-t0-be-famous) Kardena Pauza’s next six foods not to eat and want to get at least another 100 comments below. Please tell me which food you plan on not putting into your grocery cart next time. If you are trying to lose weight, I’m sure you want to feel great and have energy along your journey to a healthy leaner energized you! What you eat has a direct effect on how you feel. Snacking on high nutrient foods helps you sustain higher energy throughout the day, unlike these 100 calorie snack packs. Food corporations have been marketing 100 calorie snacks hard in the last couple of years. But remember: ingredients are very important, not just their calorie count! Just because a food is low in calories does not mean it is healthier for you or makes it ok to eat since it’s a smaller portion. If calories were all that mattered, what would happen if all your calories came from sugar? Your body would break down, get sick, and basically stop functioning. Many of these 100 calorie snacks have zero-to-no nutrition value, no fiber, very little protein or vitamins, and lots of high fructose corn syrup, hydrogenated oils, refined flour, sugar, sodium, carbohydrates and artificial flavor. And be careful, because recent studies have shown that the package barrier is not enough to stop people from eating 2, 3, or 4 packages in a sitting! You may be satisfying an immediate craving but your body is paying for it. You pay way too much for these little snacks to get zero nutrition. And if you want to be money conscience, beware! These pre packaged treats are typically 3-4 times more expensive than buying the regular size box. Hostess, Nabisco, Kettle, Nestle, and Breyers snack packs. Heck, even Girl Scouts have 100 calorie snack products available; cookies, crackers, ice cream bites, candy bars, popcorn, pudding, fruit snacks, brownie bites, etc. Want to lose 5 lbs. in less than a week? Cut out high sodium foods, especially high sodium frozen dinners. Frozen dinners have become synonymous with high-sodium meals. In my opinion, they put tons of salt in the meals to kick up the bland taste of the frozen foods. I grew up eating froze n burritos and frozen kids meals and they tasted pretty good. I would have a burrito as my afternoon snack with some more high sodium salsa and I was a happy camper. I didn’t know this was contributing to me looking bloated and gaining weight until I was in my twenties and I figured it out. Eating a vegetarian diet for weight loss can be challenging because many of the prepared meals on the market predominantly load up the meal with carbohydrates like rice, pasta, or potatoes. Carbohydrates from grains are so dense in calories that we only need to eat a small amount to have enough energy for the next 3-4 hours of your day. Remember, you only need enough energy for 3-4 hours then it’s time to have another snack. Reading the nutrition label, some meals contain up to 55 grams of carbohydrates. This is too high for anyone who wants to trim down. Aim for an estimated 25-30 grams for women and around an estimated 30-40 grams for men. Reading the nutrition label is important because the amount of sodium in frozen foods ranges from 350mg of sodium to 900mg! Now, to put this in perspective, a healthy amount of sodium a person should have in a day is 1500mg. 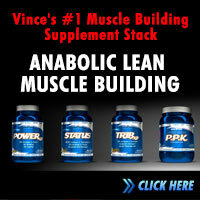 The average American consumes about 4,000mg per day! For example the average Chinese food dish is 1,100mg. Let’s average out how much sodium is acceptable in a meal. 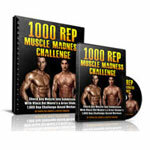 Divide 1,500-2,000 mg by 4 meals and you get approximately 375-500 mg per meal. If you are exceeding an average of 1,500-2,000mg of sodium per day, your body responds by retaining water, causing high blood pressure, and a host of other health issues. Another helpful tip, look for products that use sea salt instead of iodized salt. The body can process sea salt better and won’t cause as many health problems. Look for meals with no more than 300-500 calories, keep your carbohydrate intake low and add more veggies or a salad to boost nutrients and to fill you up instead of going back to the carbs as fillers. 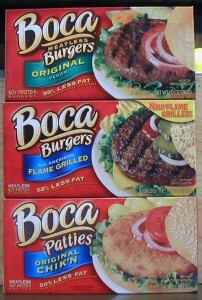 Next, I am going to pick on veggie patties, specifically Boca Burger, Garden Burger, and Morningstar. These are pretty good substitutes for a sandwich or burger, but the problem is the total carbohydrates and sodium content. Looking at the Boca Burgers and Morningstar patties, the total carbohydrates for 1 patty is around 10 grams, which is pretty good; however, the sodium content is between 300-500mg per serving. The sodium gets pretty high so you have to be careful not to exceed your total sodium for the day if you eat one of these patties. For all the women-do not eat two slices of bread with the patty, only one slice to stay within your total carbs for that meal. Add a nice big salad with your veggie patty to give you a more balanced meal. For guys-two slices of bread is ok with this particular patty. Remember, given the amount of sodium and carbs in one patty, one patty probably won’t satisfy your hunger, but eating two patties will bring your sodium intake sky high! You will balloon up after this meal! Add a nice big salad with your veggie patty to give you a more balanced meal. Most of the Garden Burgers have a higher amount of carbohydrates per patty so be careful when eating ONE with bread. One of the main ingredients along with soy is rice, that’s why there are more carbs. Making your own patties at home is a better option that would taste great (hopefully), would be healthier for you, and save you money. Make a big batch of your favorite patties and store some in the freezer for when you are short on time. I know everyone has busy lives so making your own patties seems like a daunting task, but if you take some time to make them it will take less time overall. This way there’s no rushing to go out to lunch, drive to a restaurant, fight for parking, stand inline, buy food, eat, and rush back to work. Makes me tired just thinking about it! Instead, you get to sit outside in the sunshine or on the grass and enjoy your hour of peace. You will actually have extra time and you will have to find something to do on your lunch break! Call a friend you haven’t talked to in a while and say hello. You already know that white bread should not even be an option when you are grocery shopping, right? After all, in the process of making white bread, more than 30 vitamins, minerals, and nutrients are eliminated, including vitamin E, vitamin B, protein, and fiber, and only 5 nutrients are fortified back in to the final product. Most folks know that white bread should be avoided, but don’t know the truth about so-called, “Healthy Wheat Bread”. 1. “Does your bread have chunks of grains in it? Not just on the top crust but throughout the bread?” Usually the answer is no. 2. “Is it doughy? Can you take it and wad it into a ball?” Answer is yes. 3. “If you put water on the bread does it turn into a big blob of dough?” Answer is yes. The answers usually tell me that they bought white bread “pretending” to be wheat bread. What do I mean by “brown white bread”? Wheat bread (brown white bread) means that bread companies use wheat grains to make the flour for the bread. Bread can be made from lots of different flours, including rye, barley, millet, oat, etc. So just because it’s made with wheat flour doesn’t mean much. Nowadays, most of the breads on the market are made from wheat and after they strip the germ and fiber from the starch of the grain, they combine only the starchy flour with some minor 5 fortified vitamins which they just stripped out of the bread in the refining process, then they add brown food coloring. The refining process takes out the healthy oils so the bread can sit on the store shelves longer. Food coloring could be from caramel or molasses to make light colored bread look brown. The problem here is that once the fiber is stripped away, it becomes a high glycemic food meaning the body breaks down the flour to blood sugar very quickly giving you a shot of sugar which your body will store as fat by way of several processes! There are a couple of ingredients to watch out for in bread. And these 2 ingredients have been repetitive throughout my special report and those are hydrogenated oil and high fructose corn syrup. At least 90% of the breads at conventional grocery stores contain both of these ingredients. Do NOT buy them. If you are going to eat bread, choose whole grain chunky chewy bread. Don’t believe the front packaging so read the ingredients list to give you the down and dirty real answers you need to make your decision. The best way to know is when you look at a slice of the bread, make sure it’s completely chunky, and not smooth fine flour. This type of bread digests slower because of the germ shell and fiber content so it is a time released energy source. This means it is a low glycemic food-this is what you want! Helpful Tip: Put your bread in the refrigerator or freezer to keep longer since it doesn’t have the highly processed preservatives. Let’s talk about tasty smoothies and discover the truth about Juice it Up, Jamba Juice, Smoothie King, or whatever your local smoothie shop is called. Smoothie shops are another out-of-control calorie and sugar crazed vegetarian food. So many people go to their local smoothie shop to get a “healthy” breakfast or lunch, but if you buy a 32oz fruit smoothie of any kind, it will have the same amount of sugar as if you ate 3-4 snickers bars in one sitting! You’re looking at roughly 100 grams of sugar-this is staggering to your belly! The sugar in smoothies is NOT all fruit sugar, but also high-fructose corn syrup in sorbets and sherbets and fruit juices enriched with sugar. Along with the high sugar content, some of the fruit used in the smoothies is shipped to the store as pulp which means it has gone through some processing and has begun to oxidize, diminishing the nutrient value. What would you add to your nutritious smoothie in the morning if you were to make it yourself? Would you add sorbet to your shake? Isn’t sorbet a dessert we eat once in a while after a well balanced meal? Well, that’s what 90% of these smoothie shops use in their drinks. You have to read all the ingredients before ordering. And now let’s talk about your smoothie order at Jamba Juice. Most people go for at least the 24oz smoothie. (Let’s face it, who orders a small 16oz smoothie?) The 24oz gives you approximately 50-80 grams of sugar! The craziest smoothie they have is the Cold Buster. A Cold Buster smoothie implies it will help you get over a cold, but it contains an outrageous 94 grams of sugar! I can tell you this should be called the Cold and Fat Feeder not Cold Buster! Only knowledge gives you the ability to make better choices and to be more responsible for your health, so ask questions before ordering at these places so you can make healthier choices for yourself. Remember, they want your business so they are usually willing to modify a smoothie for you. Healthy Tip: Make a smoothie with only protein powder, frozen fruit, a little juice and ice. That’s it! No added sorbet…your modified smoothie will have a more natural flavor and won’t taste like you’re sucking down straight sugar syrup. 10. Frightful Facts about your Favorite Fruit Juices! Buyer beware! Just because there’s a nutrition-oriented statement on a package (like “contains whole grain,” “excellent source of calcium,” “fat-free,” “100% juice” or “25% less sugar”) doesn’t mean it doesn’t contain a shocking amount of sugar. So there you have it. Thanks a lot Kardena! Now it’s your turn to share what food you plan to eliminate from your grocery cart next time you shop to take a positive action towards more energy, better complexion, a cleaner body and sexier physique. Vince, you are the best! Thank you for 'blowing the lid' off of some of these marketing/advertising ploys that we, as consumers buy as gospel. Thank a lot for your instructions and advices. I was trying to control the foods but did’t know how to do it. Your information would be placed me in the right path…. thanks a lot for the information… it is very useful to persons like me who is trying to watch weights…..it is very informative… now i will really try to give time to check on food labels and be more conscious of these… thanks a lot. Great tips. Lowering your sugar, fat, and sodium intake will help people lose weight fast. These are enemies to the human body. Originally Posted By Fenella PearsonLots of veggie burgers have Quorn in them – that’s made from a yeast product, is often covered in breadcrumbs, & for both reasons fattening; not because there’s a lot of calories in them, but because any kind of yeast can cause Candida, & that stops you losing weight. Every bit as damaging as sugary smoothies, breakfast cereal & bars & high sugar sodas. Wrong wrong wrong! If you look at the packaging you’ll find Quorn is made from mushroom protein not yeast. It is high protein, low glycemic, low calorie and generally a great help to vegetarians and meat eaters alike. You may find it’s a component in a less healthy product (like any healthy food might be), but remember to check the packaging for nutritional information. All Vince’s advice here has a common theme. Sugar is the enemy. Avoid it. In the UK quorn is readily available as mince, chicken style pieces, chicken style fillets and other basics. All very healthy. All very good. Just check the label. 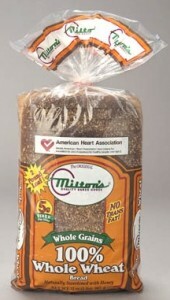 this is an excellent choice and probably best for whole grain bread. This is another great list of “food” to avoid and I keep teaching my clients to eliminate them from their grocery list. Great job Vince to spread the world about it! Together all of us, fitness professionals, can make people healthier without drugs! In fact, most of human immunity is build in GI system. The only thing on this list that I have messed with is the wheat bread. I will have to pay more attention to the breads im getting as well. Kinda shocking to see that the bread is not what is should actually be. Wonder if we can sue for false advertisement lol. I have been trying to convince my parents that those 100 Calorie Snack Packs aren’t good for you, but they just keep saying things like “Oh it’s not about how healthy they are, it’s about knowing how much you are eating and it helps you to control how much you eat”. BUT IT DOESN’T HELP WHEN YOU ARE EATING A BUNCH OF GARBAGE!! I have also tried to convince them to read some of the information here, but they just say that everyone says different things are healthy and every year it changes what’s healthy and what’s not, so there is no point listening to the “experts”. Funny how they are overweight and always complaining about it and I am 6’1 and 170 pounds…. I think the biggest thing stopping me from losing more weight is sodium. I keep everything else in order, but i do have a lot of processed meats filled with sodium, but i didnt think sodium was that big a deal. Now i know. Wow, that was an eye opener as to the salt content on alot of these foods. I definitely will check my ingredients much closer in my future shopping. I am dealing with high blood pressure (with medication) and am trying to get to the point where i eat healthy enough that i no longer need these meds. I already only use sea salt very sparingly when i cook and avoid all the prepackaged snacks etc because of the high calories and salt content. Thank you for the information it helps tremendously while i work at losing the last 30 pounds (down 75lbs in past year). Keep up the great work! I grew up in Poland and was lucky to have mostly organic foods, including raw milk or rye bread straight from the bakery, widely avaiable, so being introduced to all those processed foods in U.S didn’t really agree with me. I’ve tried some of the products on your list, but ended up going back to my “roots” I recently visited local health store and discovered Ezekiel bread. It’s made without flower, and only with sprouted whole grains. It’s very crumbly and tastes awesome. Thanks for the heads-up on hidden calories and bad fats. I’ve learned a lot about eating clean from your tips and blog posts and a lot about working out as well. But what’s been the most helpful has been your ability to motivate! Keep at it man… you have a gift! To make a veggie burger with a whole wheat 21g carbohydrate bun, use the Arnold Select 100% whole wheat sandwich thins. Hey Vince, great stuff to know..I don’t eat any of that…if I buy anything packaged which is extremely rare I look at the label & nutrition info..when I eat bread it has been gluten free bread ~ Ezekiel..awesome stuff..thanks for all you do for us! thank you for this excellent expose. Really well researched, well explained, well documented. I learned something, and also felt compelled to write this note, out of gratitude, for your outstanding report. What do you think about Salsa? I eat some, not every day, but two or three times a week. It is very difficult to find good salsa which has low sodium. The reason for this is simple. Most of us live, in the summer time, in airconditioned houses or buildings. Salsa originated as a means of restoring the salt lost by those working out doors, so an authentic recipe would be full of salt, to save lives. Salt, today a poison, was, not so long ago, a very precious commodity, much sought, and highly valued!!! We don’t sweat much, in our climate controlled homes/offices, so we don’t require replacement beyond the generous amounts we consume with food. Anyway, thanks again for your enlightened article. Much appreciated. A real eye opener, my down fall is granola bars. As for bread, I simply don’t eat it, when grain is milled into flour, even the 100% whole wheat flour, the wheat germ must be removed. If the germ isn’t removed the flour will go rancid in a very short period of time (several hours). The food manufactures can call 100% whole wheat flour 100% because any of the nutrients that are contained in the germ are added back into the flour. But it still doesn’t contain the wheat germ, so it isn’t 100% whole wheat. I used to make my own bread until I found out the flour wasn’t true 100% whole wheat. I did know someone who made their own real 100% whole wheat flour, and I tried some of their bread, I ate the whole damn loaf in one afternoon with 1/2 pound of real butter, guess that wasn’t very healthy either. So basically, all the nutrition experts always get the same conclusion: natural foods only – meats/fish for protein, fruits/veggies/whole grains/starches for carbs, and natural sources of essential fatty acids for fats (nuts, fish, oils, etc.). after going through everything i have to acknowledge ,i know something about the nutrition which i never knew b4!thanks a lot for sharing the valuable info…..
All I can say is Holy SH*T!! I am a former vegetarian, and former vegan, and now am not…I have been following a cave man diet (with Vince’s help) since December. I shed 10% body fat since that time, down to 13%. Anyways, it’s shocking to see what the labels will do to try to get you to buy “healthy” stuff – it just goes to show you that it’s all about the benjamin’s, and not the health of humans as a whole. 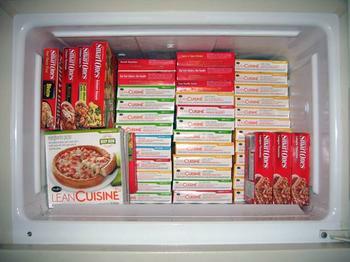 I am guilty of having a few Lean Cuisine’s in my freezer due to the low calorie count, but am going to donate them to a food shelter. Not that I want someone else’s blood pressure to rise, but I don’t want to throw them away! I don’t touch most of these, except the “bread” was an eye-opener. On alert from now on. 1) I’ve got a bread machine, where can I find healthy bread recipes? 2) I have a protein powder drink (EAS Perfect Protein) for breakfast. I also use a cup of WHOLE milk with this…sorry, but I don’t think a cup of this is nearly as lethal as the auto exhaust I get involuntarily exposed to. Are these drinks healthy and/or are there better alternatives? This is a really stimulating discussion line. what about sprouted grain breads? I love the Silver Hills brand flax seed bagels. 200 calories, 2.5 grams of fat, 9 grams fibre, 12 grams protein, 33 grams carbs (maybe a wee bit high) 2 grams sugars, 210 mg sodium. I thought this was a good compromise because I really can’t go completely without carbs. Very yummy. I noticed the picture of Miltons WW bread there. Is that not good? I buy that because I found the ingredient list looks pretty good. Orowheat on the other hand is a different story. Great information, thank you – although I must say I’m not surprised… I was vegetarian for about 10 years and gained over 100 pounds – my highest was 270. Vegetarian foods definitely make you fat. 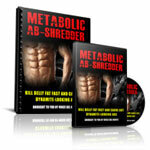 All the convenience foods, carbs,. milk fats, such as cheeses – very, very bad for your waistline. People are always surprised, but you have a ton of junk options being vegetarian. When I got pregnant I re-introduced meats at the suggestion of my doctor because I had become anemic. So I started eating meats again, but it never really felt right. I switched over to a raw vegan diet and dropped 120 pounds in 8 months and have never felt better in my life – mentally and physically. I have had some serious bumps in the road of life lately and have lost my way nutritionally speaking. I feel best around 150… Within 2 months time, I dropped 25 pounds of pure muscle down to 120 and when I started eating again I put on about 50 pounds within 3 months time. Right now I’m sitting a little under 180. So I’m looking for a way to get that edge back – I’m thinking about going back to raw vegan – because it just felt so good. 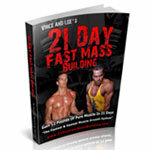 It is very difficult socially though… Has anyone had any experience with this and building muscle? More than anything, I just need to be healthy… Exercise is the only thing that keeps me sane – better than antidepressants, but I need to get my diet back in-line too and then I’ll be on top of the world again. Thanks for the stellar information Vince and Kardena!! By fat the trickiest one on the list is bread. Really can’t stress enough about reading the nutrional labels on the packaging. Even if it says it’s 100% Whole Wheat, chances are, it isn’t. Any thoughts about sprouted grain bread? Anybody know where to get this stuff outside of over-charging health food stores? WOW………AGAIN I am guilty and very surprise with Weat Bread, I always buy this expensive Bread and thinking that is worth it to expend that amount of money because is 100% Weat Bread but I was so surprise with this information. You guys are awesome and that is why I turn to you for advise. Thank you so much Vince and of course Thank you too Kadena!!! Take it up a notch. All these foods have long been out of my life. They are all processed, mystery foods. It’s not just these foods you need to avoid; it’s ALL processed foods. Compare the ingredients of white bread and whole grain or wheat bread. You will find 1 or 2 differences, at the end you are eating the same crap, full of things you don’t even know how to pronounce. People say eating healthy is expensive but eating unhealthy is even more expensive because you buy more and you eat more thinking that you are eating healthy. Look at lean cusine, healthy choice, kashi, and the 100 calorie packs, kashi and healthy choice are super expensive (almost the same as eating organic). Hey Vince, Would you put food options to substitute these foods? That would be of great help. Thanks for the info and take care. Great and useful information. I am definitely looking at quality and not just calories. Would you provide more info on Ezekiel products (such as bread, muffins, cereals & wraps)? Thank you! If you really want to get motivated to avoid nonsupportive food, track down and see the movie, “FOOD, Inc.”, by Robert Kenner. It will blow your socks off. Wow, anyone that has been on a program like weight watchers would be in real agony over these. Most of these items come up really low when you count points and that’s the plan that most gravitate towards. I guess if people are following ww they should go with the whole food plan. It requires a bit more time since you are eating whole unadulterated foods but at least you won’t have all the extras unless you put them in. 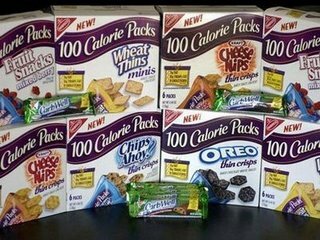 My friends with children have been buying 100 calorie pack everything believing they are helping the family’s waistline and budget. Some I knew like the wheat bread. I’m guilty of running to the local convenience shop as an alternate for lunch and rarely look at the sodium on the diet meal I pick up. Thanks for the information! This is all common sense. If people would just do their research they would know this about all foods. All I can say is come on people do a little in depth research. WTF!! I’ve been eating most of these and I thought I was being healthy. Great info on Sea Salt. I did not know that. 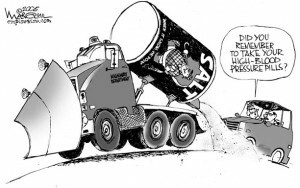 I enjoy salt but have completely eliminated it from my diet due to the health risks. What about “Kosher Salt”? I got an “A-” on the food list! I was surprised that popcorn was a definite ‘no-no’! I’ve been eating mine without butter, but guess I’ve been going to town with the salt. @Meredith – there’s an article in the June Men’s health about Soy. Needless to say, it could detrimental for men. It’s slowly being link it excessive estrogin levels on men — higher than women’s. I have to admit I do enjoy a smoothie from time to time. 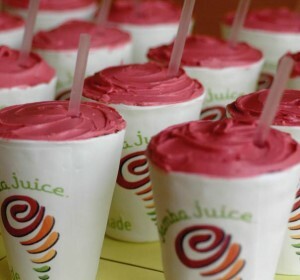 Jamba Juice does offer an all fruit smoothie that I add the dble the protein boost to. I will definetly take a look the next time at the all the ingredients. I will let you know. I used to eat all of them, but i stopped since like 3 weeks and honestly i feel better. She is scarily right on with these products and the amount of ‘HYPE’ and marketing put on the package just to sell the product. I am starting to feel like I need to be a detective when I just buy bread: searching for the ‘Bad’ ingredients. Thank you so much for putting this info out there. in regards to the breads, how does the Ezekiel 4:9 nutritional information rate with your recomendations? alas, i am quilty of the bread crime. its just so hard to get good bread in Accra. there is only one place i know and its so far away from my house, and only I like that particular bread so my mom wont buy it. This is so great! I sort of accidentally became a vegetarian a couple of years ago — meat just started making me sick. I have been drifting, not really having a plan. This list is very helpful. Saw the light a few years ago but it’s soooo difficult convincing others that their “healthy eating” is just full of crap. The reply: there’s nothing else to eat!! Talk about carb addicts! Can’t blame the food industry though. It’s up to people to wise up but a lot of them can’t be bothered but will be the first to sue doctors and hospitals for not getting them better when they fall ill. “It’s not my fault”! Hi, living in England, a lot of the foods you are talking about are very different to the ones here – do you know the food group “Quorn”? I’ve been a veggie for 12 years now, and it forms quite a large part of my diet. Can you tell me if its doing me more harm than good????? Its great to see this sort of info for veggies – thanks!!! * Check food labels to choose those with less salt. * Choose tinned vegetables and pulses with no added salt where possible. * Be sparing with sauces, such as soy sauce, because these are often high in salt. * Eat fewer salty snacks, such as crisps and salted nuts. * Add less salt to cooking – use herbs and spices for flavour instead. * Choose low-salt stock cubes, or make your own stock. * Taste your food first and don’t automatically add extra salt. simply put.. eat only natural whole real food, not packaged, not processed. Choose the food with a most little ingredient list… put the food down if it’s more than 3!! What about training drinks like Powerade and Lucozade sport are they damaging my progress. Should I just rehydrate with water? By the way great articles – very enlightening !!! Thanks Vince, that was a very informative blog post. I learnt alot, and will put this knowledge into practical application immediately. My biggest problem is salt it seems, I need to sit down and actually calculate my daily sodium intake per day. I have a feeling it is going to be incredibly high, but I suppose avoiding realities will not solve any problems. Quick snacks, I’m going to take your advice and stick with small pre-measured bags of chopped veggies or unsweetened applesauce. Definitely going to wean the family off the fake-brown bread. Very interesting information. I checked the Cereal such as Fitness from Nestle or Weetabix that I have home and I was amaze to find out that all contain sugar in them. What are my healthy cereal option that you recomment? I´ve never saw any of these “things”. didnt even knew it existed. I love this info! I think I’m an info junkie when it comes to health and nutrition. Thanks Vince and Kardena! Lots of veggie burgers have Quorn in them – that’s made from a yeast product, is often covered in breadcrumbs, & for both reasons fattening; not because there’s a lot of calories in them, but because any kind of yeast can cause Candida, & that stops you losing weight. Every bit as damaging as sugary smoothies, breakfast cereal & bars & high sugar sodas. wow…this is definitrly enlightening. Although i managed to reduce my weight by some 35Lbs, i always wondered why i was not getting rid of the last 10Lbs. I know the answer now and im surely gonna eliminate the cereals that i used for my breakfast. Gee… how the hell did i not realise that i was consuming loads of sugar? Thanks Vince and Kardena for the advice. These foods sound strange to me. Am I lucky? 😀 Thanks for the news! ive eaten the that type of bread and the whole grain, the one that has “Chunks of grains in it”,and how much can i eat???? and another thing ive drinked milk with 1 percent fat and ive drinked a low fat milk those eather of them help me if i dont have one or the other????? and how much do i drink??? Gee, that is quite tough, especially on the “frozen dinners”. I got quite a hectic schedule that sometimes, I cannot really cook my own dinner, so I have to rely on frozen foods like this: http://www.iceland.co.uk/category/view/7/Frozen+food_Roast+from+frozen and you just need to roast it in the oven. Well, I managed to get away with sugars. My problem now is salt. I’m quite like salty food, so it is really tough. I was surprised with the veggie burgers. Even with all the salt they still taste like absolutely nothing. Good job I don’t eat them anyway! The 100kcal snack packs made me laugh. My mum and sister eat Nutrigrains all the time – we’re talking 2-3 at a time. And then they sit there and wonder why they’ve still got a belly. It’s misleasing how companies use “healthy” looking packaging for not-so-healthy things, but hey, I guess it’ll teach people to read the info properly. You could wrap a block of lard up in a Slimfast wrapper and some idiot would buy it. 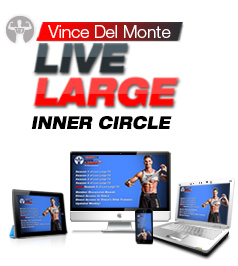 Thank you for your sharing the list Vince…I am stopping the 100 calorie paks, lean cuisine, and checking my wheat bread more carefully…hopefully I will see some results from these changes…once again thank you. I never eat any of these things anyway so no biggie for me. I’ll reiterate my ‘stick to the perimeter of the store’ philosophy and it will keep you away from all these processed foods. You can find good whole grain breads if you look carefully, you don’t have to go all the way to grinding your own flour unless you really want to. I was afraid when I saw the title that you were going to list something like soy protein or soy milk which I use all the time due to being allergic to milk. There are so many conflicting oppinions about soy, I’d love to hear your take on it. @Vince – Sorry i’m posting it again but I wanted to reply to you as I live around Guelph area too! “BOOSTER JUICE WAS MY LOVE Vince!!! Not anymore!!! I guess the only place to have one is at HOME!!! ” I usually buy the WHOLE GRAIN bread…if possible, share your findings about bread…I will check details myself too! BOOSTER JUICE WAS MY LOVE Vince!!! Not anymore!!! I guess the only place to have one is at HOME!!! Great list for reminding us all the food manufacturers cannot be trusted and we have to read every ingredient list. Even then they can fool us. Mostly anything in a packet has probably got some crap in it. I’m going to resort to buying or making a grain mill and make my own bread, pasta etc. HI, this is such a down to earth helpful list for people working so hard to lose weight,but being manipulated by false advertising or tricky language at the least. What about the ‘healthy’ cereals fortified with vitamins calcium etc. i looked at the ingredients, getting smarter! and saw sugar right on top. Didnt usually check that out. I used to buy granola bars, until I kept putting on weight- they’re fattening! not at all dietic. keep up the fantastic work of helping people eat healthy and lean! i plan on eliminating all of them from my grocery list…i feel like i’ve been living a lie…sigh. In Canada, there is place called Booster Juice and I’m guilty of getting these smoothie drinks so checked out this one I typically get and it has 83 grams of sugar in it which about double i would have even for a post workout shake for my size. I also buy a lot of “whole wheat” bread especially during bulk phases so I’m going to take a closer look to the feel of the bread and make sure it has real grains in it.